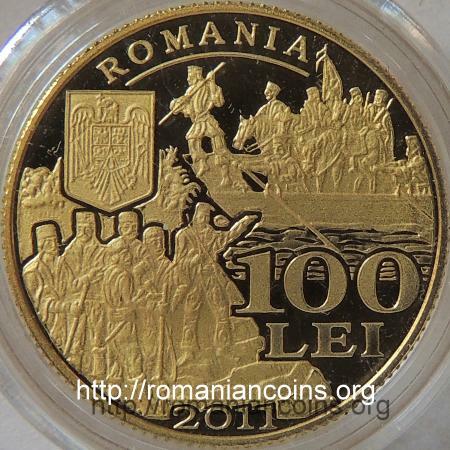 The picture on the obverse was inspired by an engraving representing the crossing of River Olt by Tudor Vladimirescu and his Pandurs. The engraving was published by Dimitrie Papazoglu (or Pappazoglu, Pappasoglu, 1811-1892, who was an officer of the Romanian Army) in the second half of the 19th century . Tudor Vladimirescu was born around 1780 in the village of Vladimir in the Gorj county. Around 1800 Tudor Vladimirescu built at Cerneţi (village near Drobeta-Turnu-Severin, in Mehedinţi county, where he owned several estates) a "cula" (fortified house resembling a small tower, characteristic for the region of Oltenia; the name came from the Turkish word "kula" meaning tower). Nowadays inside Vladimirescu's cula a memorial museum is housed. During the Russo-Turkish war of 1806-1812 Tudor Vladimirescu was member of the Walachian military formation who fought by the Czarist side. From 1810 he commanded a battalion of Pandurs. (In Walachia the Pandurs formed a kind of irregular army. The term "Pandur" was attested in Walachia from the beginning of the 17th century .) He earned the rank of lieutenant in the Russian army and he was awarded the Order of Saint Vladimir 3rd class - meaning that he had become member of the Russian nobility. In 1814 Tudor Vladimirescu went to Vienna for some affairs of the Glogoveanu boyars (he had been raised and educated in their house). The image of Tudor Vladimirescu was used during the communist period on the 1000 lei 1947, 1000 lei 1948, 25 lei 1952 and 25 lei 1966 banknotes. Beside Nicolae Bălcescu, Tudor Vladimirescu has ensured for the official history of the Romanian Communist regime a continuity to the Romanian national and social emancipation, which was revolutionary in nature, making the bridge between the rulers of the Romanian Middle Age over to the antifascist and antiimperialist revolution on August 23rd 1944 and the age of Nicolae Ceauşescu, himself a revolutionary and also initiator of the Socialist Revolution. In this quality, Tudor Vladimirescu had 4 banknotes dedicated. Only Nicolae Bălcescu and Alexandru Ioan Cuza, out all the Romanian personalities have enjoyed this type of nominal and long lasting recognition during the communist era, as positive and central national figures. In January 1821 the Phanariote ruler of Walachia, Alexandru Suţu (1818-1821), died. The country entered under the provisional rule of a "Comitet de oblăduire" (Governing Committee) comprising the great boyars Grigore Brâncoveanu (1767-1832), Grigore Ghica (1755-1834) and Barbu Văcărescu (?-1832). These boyars have charged - in writing - Tudor to raise the people to arms ("sluger Theodor we chosen you to raise with weapons and to follow as advised"). Vladimirescu left Bucharest the same day, heading for Oltenia, to Tismana Monastery. The monastery was surrounded by walls, and was fit to be used as stronghold if needed. On January 23rd Tudor Vladimirescu addressed all the inhabitants of the country through the Proclamation of Padeş (village in Gorj county, near Cloşani). Other several proclamations and memoranda addressed to the Ottoman officials followed. On behalf of the people some claims were presented: the dignities not to be bought anymore, tax reduction, abolition of internal customs, government abuse deterrence, punishment to several boyars, formation of a national Pandur army of several thousand strong. Tudor began to gather an army, which he called "Adunarea poporului" (People's Assembly). Until the end of February the army was organized at the camp of Ţînţăreni (in the Gorj County, about halfway between Tismana and Craiova). In March Tudor headed to Bucharest. On the way Vladimirescu ordered the execution of several captains who had participated to the pillaging of some boyars' properties. Meanwhile the Greek troops of Alexander Ypsilantis (1792-1828, head of Eteria) had entered Walachia. Eteria (Filiki Eteria or the Society of Friends) was a secret society founded at Odessa in 1814, a society which intended to depose the Ottoman yoke and finally to obtain the independence of Greece. By 1821, Eteria had gathered a lot of members, Greeks from Greece and from the Greek diaspora (especially from Russia, Moldavia and Walachia) and a lot of foreigners, including Romanian boyars. Romanian writer Ion Ghica assures us that Tudor Vladimirescu was a member of Eteria. The Eteria members counted on the military support from the Czarist Empire and they hinted that the leader of the movement was emperor Alexander I himself . Subsequently to a meeting between the two commanders, the country was divided: Ypsilantis - who had given up the plans of crossing the Danube (he was supposed to arrive in the Peloponnese with his troops) - asserted the rule over the mountain-side counties, while Tudor maintained control over the counties toward Danube and over entire Oltenia. By the middle of March Tsar Alexander I of Russia disapproved the Romanian and Greek revolutionary action. Consequently, Eteria's hope to receive Russian military aid was totally shattered. Several great boyars took refuge in Braşov and Sibiu in Transylvania (region under Habsburg rule). So that Tudor had no reason any longer to collaborate with Ypsilanti. He neither intended to fight the Turks, nor did he want to fight against Eteria. On May 1st the intervention of the Turkish troops began, the crossing of the Danube being made through several points. On May 15th, the Turks got close to the capital and Tudor decided the withdrawal. On May 21st Vladimirescu was arrested by Eteria members, after a betrayal. Judged by them, he was sentenced to death and executed. After Tudor's death the Pandours left the army, which was falling apart without its leader. Eteria tried to oppose the Turks, but it was defeated at Drăgăşani and Ypsilantis fled for Austria. Although defeated in the end, the movement of Tudor Vladimirescu contributed to the replacement of the Phanariot rulers (for about a century the rulers in both Romanian principalities had been elected only from the members of several families inhabiting the Greek quarter of Phanar in Istanbul) with princes of Romanian strain. 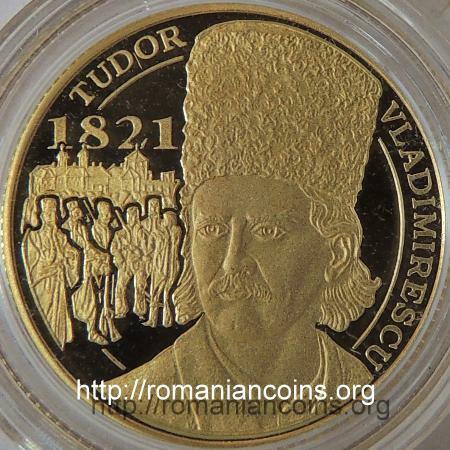 Year 1821 is currently considered as the beginning of the modern history of Romania. 1. Ghica I., Din vremea lui Caragea. Editura de Stat pentru Literatură şi Artă, Bucureşti, 1960. 2. Giurescu C., Istoria românilor. Vol. II. De la Mircea cel Bătrân şi Alexandru cel Bun până la Mihai Viteazul. Editura ALL, Bucureşti, 2007, p. 359-360. 3. Giurescu C., Istoria românilor. Vol. III. 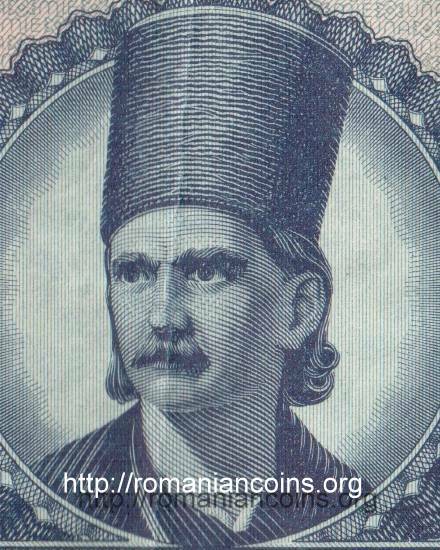 De la moartea lui Mihai Viteazul până la sfârşitul epocii fanariote (1601-1821). Editura ALL, Bucureşti, 2007, p. 528. 4. Giurescu D., Istoria ilustrată a românilor. Editura Sport-Turism, Bucureşti, 1981, p. 321.